Here’s a quick overview as to exactly what an online estate agent is and why you should consider using YourBricks.ie to sell your property. Online estate agents have grown in popularity in the UK over the past few years and YourBricks.ie is delighted to be the first true online estate agent to launch in Ireland. So what is an online estate agent? 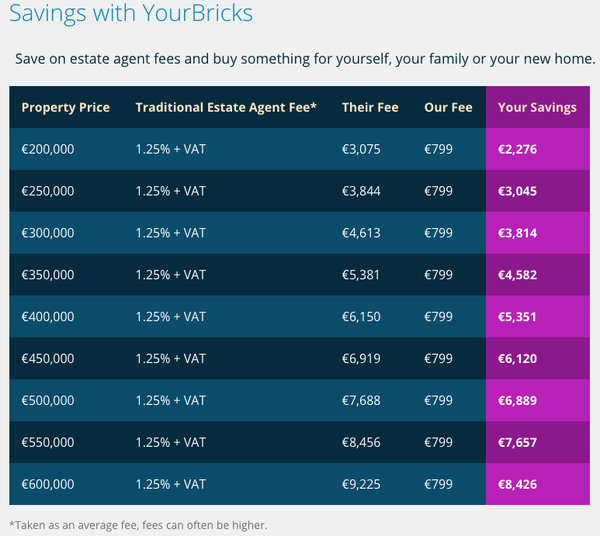 An online estate agent such as YourBricks.ie doesn’t rely on a bricks and mortar shop front and so avoids the need for expensive retail space and the accompanying high overheads. Over the past 10-15 years’ many industries have evolved and moved online and in a similar manner to travel agents, estate agents are doing likewise. What this means for the consumer is more value and brings an end to exorbitant estate agent fees. Think about it. Why should someone who owns a house that is worth €500,000 pay twice as much in commission as someone who owns a house that is worth €250,000? Not only are estate agents incentivised to put more effort into the more expensive house, but when the market rises they earn more by default. If you are selling your home you should be receiving the best value and highest level of service – no matter what your property valuation. So what is YourBricks and why are we Ireland’s premier and first true online estate agent? With our flexible packages you choose how much involvement you want and you get everything you need to sell your home, while saving at least 75% on fees. Savings can be made by hosting your own viewings. However if you would rather have us do that for you, you can simply add a viewings package and still save thousands of euro versus traditional estate agent commissions. And those savings are the equivalent of a brand new kitchen or a family holiday! Manage and message buyers: Exchange messages with buyers and filter buyers based on their financial situation. Manage viewings: You can set your preferred viewing times and receive viewing requests directly through the system. Manage offers: Receive and respond to offers 24/7. The YB platform makes YourBricks.ie an online estate agent in every sense of the word. All of our packages are available nationwide. If you would like to get a free valuation or learn more about how we can save you thousands of euro, get in touch today.